The deer falls through thin ice in Fairfield, and officials warn residents that the ice is not thick enough to support much weight. 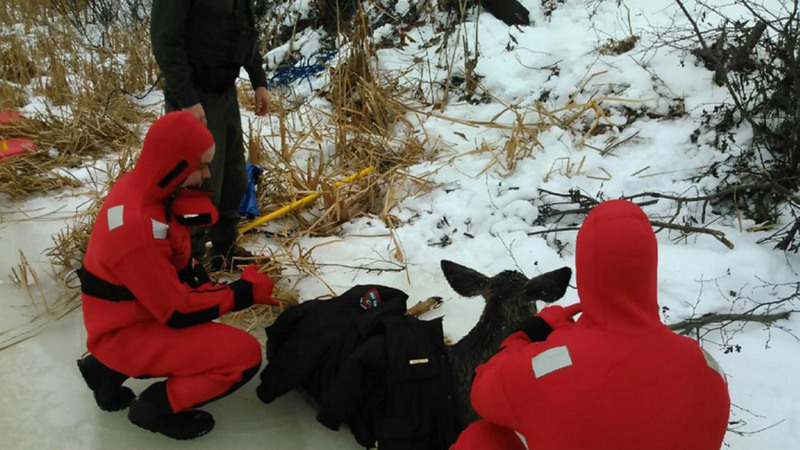 A small deer was rescued by firefighters and a game warden Tuesday morning after venturing onto the thin ice of the Kennebec River in the Hinckley section of Fairfield. The deer, a doe, had fallen through the ice into open water off U.S. Route 201 and was struggling to climb back onto the ice near the Hinckley Bridge, Skowhegan Fire Chief Shawn Howard said. Game Warden Chad Robinson went to the scene and called members of the Skowhegan Fire Department water rescue team for assistance. A command post was set up on River Road on the Clinton side of the river. Firefighter Scott Libby and Capt. 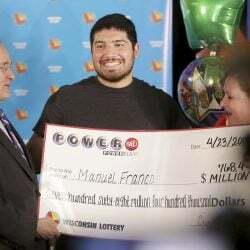 Jason Frost went onto the ice and into the frigid water of the Kennebec and grabbed the deer with an animal catch pole. They were wearing Sterns rescue suits, which are flotation suits made to be used in icy water. The suits kept the crew members on top of the water, Howard said. Howard, firefighter Linwood Corson and Robinson were on shore with a rope to drag the sled – and the deer – to safety. 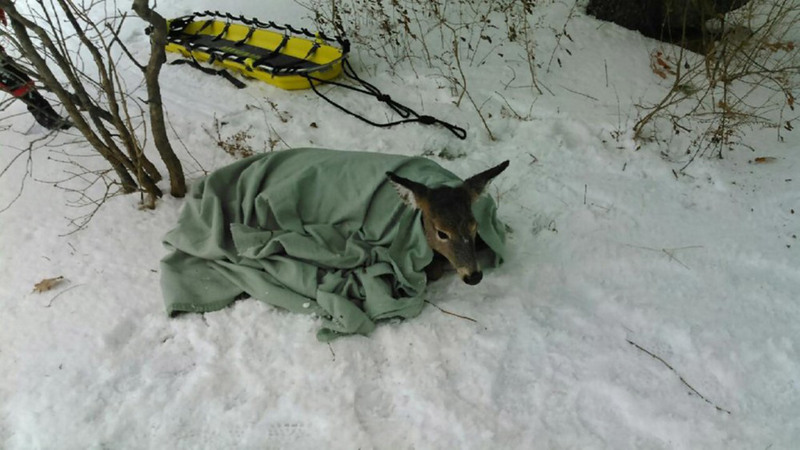 Rescuers then wrapped the deer in a blanket. Howard said the deer was a full-grown doe, about 2½ years old and weighing around 120 pounds. Howard said the deer eventually stood up, still a little wobbly, and made her way across the road and into the woods. He said the department has rescued dogs from the water before Tuesday, but never a deer. Howard said part of the reason for such a rescue is that if members of the public see a deer stranded on ice on a lake or a river, they will attempt to go out and save it themselves, possibly leading to the need to rescue a person on the ice.